This is in honor of St. Nicholas Day.. He comes from Artistic Outpost. My Trees are Tim Holtz stamps. I used another new Cuttlebug Plus A-2 embossing folder. My papers and snowflake stickers are from K& Company. I don't know how you do it Vada! His hat and suit look like velvet! Beautiful! 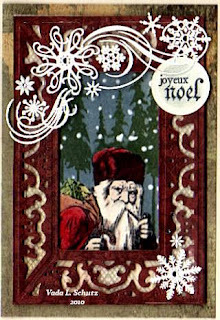 Gorgeous- love the beautiful colors you have achieved- one of my favorite Santa images too. Absolutely stunning, Vada! 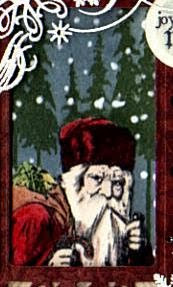 I love how you colored this lovely vintage Santa. I was just playing with that set today! Gorgeous Vada! is this a frame? if so you should enter it in this months giveaway at Artistic Outpost! This is so striking. Really in the spirit of the celebration. WOWZER Ms. V! This is absolutely stunning! Beautiful holiday decor! Thanks for using Artistic Outpost images! Beautiful card, Vada! I miss your TJ artwork so much. I need to hang out at your blog more!